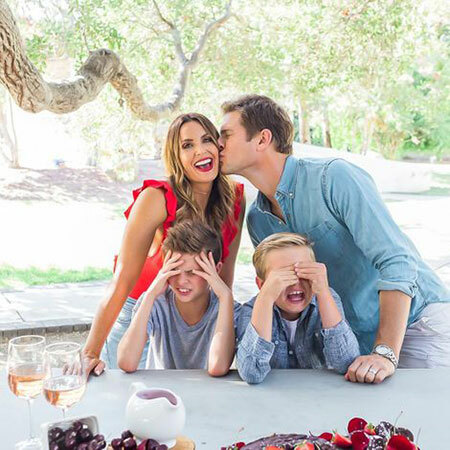 'Chuck' actor Ryan McPartlin is living sound life with his wife Danielle Kirlin with all bliss and wonders. The couple who tied the knot in 2002 is blessed with two kids who are grown-ups now. Wanna know more about the star and his personal life? Let's move further for more details! Ryan McPartlin first met his future wife Danielle Kirlin in 1998. The couple tied the knot on 26 October 2002. Kirlin is an actress known for the 2004 adventure movie Centipede. Besides an actress, Kirlin is also a food entrepreneur. She is the co-founder of 'Plate Therapy' an LA-based delivery service along with her husband. Also Read: Actor William Levy and Elizabeth Gutierrez are living happily with their two children. Are they getting married? Mcpartlin barely talks about her family life in media but he prefers sharing his family images via Instagram posts. Ryan McPartlin kissing his beautiful wife celebrating Valentines Day 2019. "Same Valentine for 20 years & counting!!! #happyvalentinesday"
Promising to be together the entire life, the pair celebrated 16 years of marriage anniversary in October 2018. As everything is crystal clear about his married life and relationship, we wish him all the very best for his future well-being. Ryan McPartlin spent years as an Abercrombie & Fitch model. He started acting on The Nanny with Fran Drescher playing a Leonardo DiCaprio-type character in a Titanic spoof. He portrayed the role of Devon "Captain Awesome" Woodcomb on NBC's Chuck (2007-2012). He also appeared in commercials of Kate Walsh's perfume "Boyfriend". You May Like: Actor Tony Campisi married to actress Kathy Bates but got a divorce in 1997. Do they have any child? He played recurring roles of police detective Dwayne Freeman on Mystery Girls in 2014 and Billy the fireman on Bad Judge. Born on 3 July 1975 in Chicago, Illinois. He attended Glenbard South High School. He received a degree in speech communication from the University of Illinois at Urbana-Champaign. He replaced Dalton James as Hank Bennett on the famous soap opera Passions.